Berkeley, CA â€“ 1 July 2011 â€“ The captivating world and quirky characters detailed by award-winning artist Sonny Liew’s (LIQUID CITY VOL. 1 and 2, My Faith in Frankie, Wonderland, Sense and Sensibility) loose and emotive watercolor-drenched pencil work are set to charm readers in August, with the release of MALINKY ROBOT: COLLECTED STORIES AND OTHER BITS from Image Comics. A recipient of the Xeric Award and Best Science Fiction Comic Album award at the Utopiales International SF Festival, MALINKY ROBOT blends dystopic sci-fi and indie sensibilities into a uniquely oddball world, where street urchins Atari and Oliver scrounge, steal bicycles and watch Giant Robot movies. 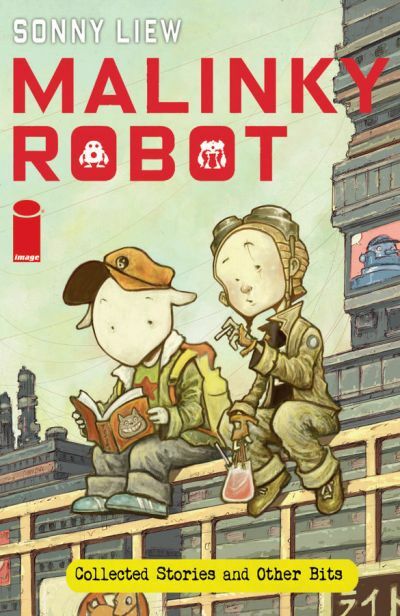 MALINKY ROBOT: COLLECTED STORIES AND OTHER BITS TP (JUN110503), a 128-page full color collection of short sequential art stories retailing for $16.99, will be available at a comic store near you on August 3, 2011. It is available for pre-orders from Diamond Comics, and from retailers such as Amazon. For more information, please visit www.malinkyrobot.com. Sonny Liew is an Eisner-nominated comic artist, illustrator and painter. His work includes titles for DC Vertigo, Marvel, SLG and Disney. He has also served as editor and contributor for Image Comics’ Eisner-nominated LIQUID CITY anthology. For more information, please visit www.sonnyliew.com.